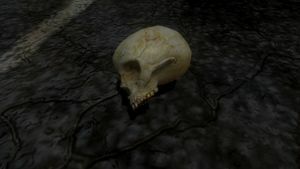 An example of a skull in Halo 3. Halo 3 Skulls are human skulls hidden in Halo 3's Campaign. Once activated, a skull makes gameplay either more humorous, or more challenging. The skulls greatly resemble those in the Multiplayer game variant Oddball, and can be used as weapons in much the same way. However, they lack the information text (i.e. "Press RB to pick up...") to pick them up. They are usually hidden and out of the way, so one must thoroughly search for them, or know where they are, to get them. There are thirteen skulls in Halo 3, along with a fourteenth secret skull on Cortana. To unlock a skull, you must start its level from the beginning, on Normal or higher. You can stop playing at any time (provided you resume using the "Resume Solo/Co-op Game" option from the main menu), and you do not need to carry the skull all the way to the end (with the exception of the IWHBYD skull). The Mythic Skull is the only skull available on Easy, although you will not receive the achievement for it. Also, a very important note is that the skulls are affected by physics. This means that, with the exception of the Famine Skull, skulls can be moved by grenades, explosions, and other forces. Once a skull is unlocked, you can activate it from the Campaign Lobby. Simply press X while in the Campaign Lobby, and then select a skull with A to activate it. Multiple skulls can be activated at once. There are two different types of skulls: Gold Skulls and Silver Skulls. Gold Skulls will, when unlocked, grant you achievements, each worth 10 Gamerpoints; when activated, they add multipliers to your Campaign Meta-game score. The nine Gold Skulls affect the difficulty of game-play, making the game more challenging. Silver Skulls do not unlock achievements or add multipliers to your meta-game score. They are differentiated on the selection screen by their color, but are identical in-game. There are five Silver Skulls, and four of them affects the physics, dialog, and appearance of gameplay. Collecting 5, 9, and all 13 skulls of either type will unlock the Hayabusa Chest, Shoulders, and Helmet Armor Permutations, respectively, for usage in Multiplayer and Matchmaking. In Halo: The Master Chief Collection, the functionality of Halo 3 skulls is identical, with two differences. All skulls (and Armor Permutations) are unlocked for gameplay from the start. The skulls can still be found and collected in campaign for achievements: both gold and silver skulls unlock achievements worth 5 Gamerpoints each. Iron 3× Teammate dead = Reload checkpoint. Everyone dead = Restart level. Black Eye 1.5x No auto-shield regeneration. Only melee attacks cause shields to recharge. Tough Luck 1.5× Grenades, Needler fire, projectiles (i.e. Rocket Launcher, Brute Shot, and Fuel Rod Cannon) and vehicular charges are evaded more skillfully by the AI. Brutes go Berserk more often and Grunts will turn Kamikaze more often. Catch 1.5× NPCs throw many more grenades at an alarming rate. NPCs always drop two grenades when dying. Fog 1.5× Motion Tracker is fully disabled. Famine 2× Dropped weapons have much less ammunition/charge. Thunderstorm 1.5× All enemies are promoted to higher ranks. (More experience) . Tilt 2× Enemy defensive resistances/weaknesses are amplified. Mythic 2× All NPC's health allocation is doubled. The Iron Skull is located on the left side of the image. Icon: A skull marked with a hammer. Effect: If you die while playing solo, you will respawn at the very beginning of the level - The "Revert to last checkpoint" option is no longer selectable. If any player dies while playing Co-op, all players will respawn to the last checkpoint. This is similar to what would happen when playing Co-op on Legendary in Halo 2, but it is slightly more harsh on the players. Battle through to the level normally until you arrive at the point where you must rescue Sergeant Johnson and his team. Snipe as many enemies as you can before jumping down, especially on the bridge. Jump down and cross the bridge. Keep to the right of the bridge until you see a blocked line with some pipes. Hop onto this block and continue. When you reach the end of this raised block, jump up into the balcony. Follow this balcony to the end, the skull is hidden behind a pillar jutting out from the building tucked into the corner. Skull is located on the pipe. Icon: A skull marked with a smaller skull with a bruise under one eye. Effect: Your Energy Shield will not recharge until you perform a melee hit. The Energy Sword and Gravity Hammer's RT attacks count as melee attacks. The shock-wave created by the Gravity Hammer will also recharge your shield. Hijacking also counts as a melee attack. At the beginning of the level, walk to the door leading to the barracks, then turn around. Walk to the green metal rack and jump on top of it. Turn to the right, look up to the red metal beam, and jump on it. To the direct right again, is a much larger blackish pipe. Jump on it. Walk along the pipe, taking care not to fall off, and you will see the skull at the end. The pipeline that must be traversed to the Tough Luck Skull. Icon: A skull marked with a three-leafed clover. Effect: Enemies dodge Grenades, Needles, slow moving projectiles and vehicle assaults with a greater success rate. Keep battling through to the point where you must fight a group of Brutes, two of which are using Choppers. Kill all the enemies, destroy the shield, then continue through until you reach a long, winding bridge. At this point, a Covenant CCS-class Battlecruiser should fly overhead. To your left, you will see a series of yellow ladders. Go to the very last one. If you receive a Regenerator at the top, you will know it is the correct ladder. Jump over or around the large metal bar on the right, then turn to the left. Look down and you will see a large, black support below you. Jump down onto it. Note that you have to walk and be standing on the part of the pipe that sticks out slightly with the bolts going through it—otherwise, you'll take too much fall damage and die. Walk along to the end of the support, then turn to the left again. Now you should be able to see the skull on a cliff across a gap. Jump across the gap on to the cliff, and get the skull. Note: This Skull and Famine seem to increase the likelihood of encountering Kamikaze Grunts. The Catch Skull is located on top of the silo. Icon: A skull marked with an image of a Plasma Grenade. Effect: All AI-controlled units, friend or foe, throw grenades more often, where applicable. It even affects scripted grenades. For example, on the level Crow's Nest, on the part where the Warthog is hit by a Plasma Grenade, it will now be hit by two, three, or even four. The Catch Skull has no effect on Flood. It should be noted that characters will throw an unlimited amount of grenades at their enemies. The skull actually does seem to increase the number of Kamikaze Grunts. It has been observed that the Marines will sometimes throw grenades with reckless abandon, similar to their behavior in Halo: Combat Evolved. If you have the Easy Shield in your service record, the skull will NOT spawn. You have to beat the campaign on normal or higher to make the skull spawn again. Battle through to Lakebed A -- the point where you fight an Anti-Air Wraith, a handful of Ghosts, and a standard Wraith. You should see a silo-like building (see image). On top of this is the skull. Look for the ramp that leads over to the platform where the normal Wraith is dropped. There are multiple methods which can be used to get onto the building. Hijack the Anti-Air Wraith and maneuver it so the back (the part with the plasma mortar, or in this case, fuel rod launchers) touches the base of the silo where the ground rises slightly; then, simply get out. The only problem is that this will cause an NPC Hornet to fire upon the standard Wraith, and the Wraith may focus its fire on you, so you will need to work a little quickly. The Anti-Air Wraith should remain still while you jump on the back and onto the top of the silo. Park a Ghost below, then jump from it onto the building. Use an Explosive Jump if necessary. Park one Ghost on the Wraith-side, then get another Ghost and park it on top. You should be able to simply jump on top of the Ghosts, then onto the silo. Take a Deployable Cover, then use it between the red wall and the building. Move out of the way and you can use the cover as a stepping stone. On Co-op, one player can jump onto the other player's head, then onto the building. Drive the Warthog at the foot of the silo and crouch-jump onto it. Make sure that the Warthog is at the Wraith-side of the silo before attempting the crouch-jump. Drive the Warthog between the silo and the wall so that it is turned on its side. Jump onto the red wall, then jump onto the silo. Note: Do not destroy the standard Wraith, or the skull will disappear. Do not physically damage the normal Wraith (though the plasma turret operator can be sniped safely) in any way or the skull will disappear. Icon: A skull marked with a swirl of fog. Effect: Your Motion tracker is disabled completely. Walk into the destroyed city of Voi. As soon as you enter the city, there is a building with an ICBM Launcher on the right. Move to the middle of the road that leads in and left. Take out a weapon with a scope (preferably a Battle Rifle) and look up and to the right (to the top of the right hand building). Wait for a Marine to say over the radio, "All squads, report." You will see a Flood Combat Form on the roof of the building to the right. It will jump across the street above you as a Marine replies, "There, over there!". You can either kill the Combat Form, making it drop the skull, or, you can shoot off it's right arm. You may either kill it whilst it is still on the first roof or try to shoot it while it is in midair. The skull will fall to the ground between the two buildings. The Famine Skull on The Ark. Icon: A skull marked with a smaller skull. The smaller skull seems to have a line between it and some dots (food). This describes the obvious traits of a famine. Effect: All weapons that are dropped by enemies or are scripted to spawn on the ground (e.g., near a crashed Pelican or group of dead bodies) have halved or reduced ammunition or charge. However, weapons found in cases still have the standard amount of ammo. After obtaining the Scorpion, you will be directed into a fork in the road. Going straight will lead you into a giant bowl-like valley, and going to the right will lead you through a broad sandy road. To the left is the bowl with two roads cut into the rock face. Go to the right and drive directly ahead until you hit the rock wall. Method A: Stick a Plasma Grenade right where the beam-like support and incline meet (on the bottom edge of the incline). Back up, run and jump, aiming a little higher than the skull. You should be just over and a little forward of the grenade when it explodes giving you enough of a boost to reach the skull. Method B: Pick up a Deployable Cover and place it in front of the pillar with the skull and use it as a step to the ledge. It may take a few tries to place it exactly at the perfect spot, as it may slide off and fall off the ledge. Method C: Play the game in Co-Op mode. Stand on your friend's head and have them run and jump towards the skull. At the highest point of their jump, jump over to the ledge. If performed correctly, you should land on the platform. Method D: Deploy a Bubble Shield so that the edge of it is near the edge of the structure. The Bubble Shield should keep the grenade you throw inside it so right after you throw, jump, and the grenade should give you a sufficient boost. Method E: Take a Brute Shot, and aim it downward but still on the building Take a leap, and as you jump, fire downward and you will be able to launch yourself to the skull. Method F: If you saved the Rocket Launcher from the downed Pelican, you can rocket jump by positioning yourself a suitable running distance from the platform with the skull, running at it backward, jumping as you reach the slanted floor and firing a rocket. The blast should be sufficient to propel you to the platform. It may take a few tries to get it without killing yourself, and is inadvisable on any difficulty other than Normal for this reason. Method G: Find a few Ghosts, and use the boulder and a boost+A-button combo to get them onto the platform. Then stack them near the spot with the skull and you should be able to jump from on top of them to the skull. Method H: On the way back through this canyon, after getting the Scorpions from the Forward Unto Dawn, as you pass under the arch and blow up the Phantom, there is a wall to the left of the part where the canyon narrows that you can drive a tank up. If you drive one up, then wedge it in the area where the Forerunner structure comes closest to the cliff you're on, you can take a second tank up the cliff, and drive it across the bridge made from the first one, onto the Forerunner structure, then, with some careful positioning, use its turret as a platform to jump to the skull. Method I: Use Chopper to get up to the platform through the rocks and park it on a slanted platform where your jump can reach where the skull is. This may require several attempt to do it. Icon: A skull marked with a lightning bolt. Effect: All enemies and allies are promoted to the highest available rank. The number of shielded Flood Elite Combat Forms and shielded Sentinels is also increased. After deactivating the first tower, there is a part in the level where you have to fly a Hornet to the third tower. As you hop into the Hornet, the title If You Want It Done Right will be displayed—if it isn't, then no skull will appear. On your way to the third tower, you will see the second tower (which was disabled by the Elites). This is also the tower with the Terminal. Fly over to it. There is a long, flat, semi-enclosed part of the tower that extends out over the ocean. There is a very tall ramp that leads up to it. At the end of the extension you will find the Thunderstorm Skull. The Tilt Skull in its hiding place. Icon: A skull marked with a smaller skull with a hole in its head. Effect: All enemy weaknesses and resistances double. Example: Brute armor is twice as weak to plasma weapons and twice as strong against projectile weapons. The skull is at the top of the large circular room where Cortana says "It was the coin's fault! I wanted to make you strong, keep you safe (drop in tone). I'm sorry, I can't..." When you enter this room you will fall out of a hole in the ceiling, next to a sitting, dead Elite. To the left of the room will be some small, somewhat fungal, growths on the walls. Near this is a rounded pillar. Stand on the pillar and jump to the thin growth outcrops to the left. On many of them, you will hit your head on an obstruction above if you are not careful; spoiling the jump. After the first two to the left, turn around and look away from the rock wall - then left ninety degrees for another one with a longish extrusion of Flood material. This one is difficult as your head will hit the wall with jumps from many of the obvious positions. One jump that works is at the tip of this jump, back about 2 feet from the edge, and jumping slightly left (approx one foot) of the tip of the target jump. Another jump that works is; When you get on the upper outcrop on the left, facing the other outcrop you are jumping to, move as far as you can to the left. Then, jump toward the other outcrop with the extension of flood material. Walk up the extruded Flood tentacle onto the roof of the area where you will find the Skull in a small pile of blood and bones. Note that underneath the platform you usually walk on are two to three Deployable Covers near the Terminal with Cortana's message. These can be placed on the pillar and the ledge to make the jumps easier and help you avoid things that can cause your jumps to fail. Effect: All of the Covenant you encounter have twice the amount of health and shields. At the beginning of the level, move forward, hugging the right wall and curving slowly left in the cave up ahead. After a short amount of time, you will see a tunnel opening to the right. Move through this, but still hug the right wall. Part way along an opening (cave) on the right will open up. Move inside, turning your flashlight on (up on the D-pad of the controller). Soon you will reach a dead end, and the skull is on the ground, among the rocks. Silver Skulls provide no score multipliers when turned on. Icon: An eye with the pupil crossed out. Effect: Your entire Heads-Up Display is disabled. You can't see your weapon, shield meter, motion tracker or ammo/grenades. Go to the area where you first encounter the Covenant. There should be a Brute Captain Major and a few Grunts. Face the large body of water and look for the protruding rock. Jump onto this rock. There should be another rock. Jump on this. Walk to the end of this rock and pick up the skull. The effect of the Grunt Birthday Party Skull. Icon: A skull marked with a candle. Effect: If a Grunt is shot in the head with any headshot-capable weapon (such as the Battle Rifle, Beam Rifle, Carbine, Sniper Rifle or Magnum), a popping sound is heard, colorful confetti explodes out of it which causes minor damage to nearby enemies, and a sound clip of children cheering from the game Hurray! "can be heard in the background. When the Grunt's head explodes, their mask will usually fall off. Method A: On your way to the barracks, you will come across a section in the level where you are required to drop down into a shaft, and at the bottom, are several pipe entrances, where Drones fly in and out of. Reaching the bottom will initiate a Cortana Moment. If you walk to the end of the corridor, there is another large drop (purple pipe with a rotating fan), but do not jump down. Instead, look down around the drop and you will notice a small ledge protruding out a little bit with a green arrow just visible in the middle of it. If you approach the edge very slowly and walk backwards very quickly as soon as you fall, you will land on the ledge. The skull will be located at the end of the passage. Method B: After the battle with the Chieftain and Brutes, grab a grav lift. Continue on until you are in the shaft with the drones. Walk down the corridor and go down the large drop. Turn around and throw the grav lift. Go through it and then you'll enter the passage with the skull at the end of it. Note: Try to lay the lift as near to the pipe as possible; laying it in the middle won't always work. Icon: A skull marked with a cowbell. Effect: Physics impulses are increased. Explosions and melee attacks launch characters and objects farther, but the damage is not affected. Method A: Use the Grav Lift to get there. The ideal place to deploy it is about three fourths of the way down the ramp, and a little to the left of the center, while facing up-ramp (facing up-ramp will ensure the Grav Lift doesn't slip farther down). Run down the ramp and jump, such that you reach the peak of your jump while directly over the Grav Lift. You should also be running towards the tall section, aiming towards the middle of the top shelf on the section. If your Grav Lift expires or is destroyed, you can always revert to last save since the room containing the skull is a checkpoint. If you have difficulty getting there, crouch while being Grav-Lifted. This may take a few tries. Method B: If you are having too much trouble placing the Grav Lift, it is possible to drive a Brute Chopper into the building. You can then drive the Chopper to the bottom of the ramp, jump onto it, and deploy the Grav Lift, which will go through the vehicle. You should be elevated to the opening with the skull. Method C: If you are playing on Co-Op, have two of the players grab a Grav Lift. One (Person A) should drop their Grav Lift before the platforms, use it to go up to the fourth level (one below the skull), and wait for their partner (Person B) to join them. Person B should stand right on the edge of that platform and deploy their Grav Lift while facing straight down. If Person A placed the first one right, then the two Grav Lifts should line up, with one hovering above the other. Person A should then walk backwards off the edge and onto the Grav Lift(s). A will end up being suspended above the platform with the skull, at which point they should just keep holding the left thumbstick forward until they move onto the platform. If they can't move forward, they should keep pushing forward anyway, because when the lower Grav Lift breaks, they will drop onto the platform. Method D: If you managed to pass through the previous room without setting off any of the plasma batteries, push one down to the edge of the openings, detonate it with a plasma grenade or a brute shot, and explosive jump to the top opening. Icon: A skull marked with a double helix. Effect: Rare dialog is more common, and vice versa. Directions: Near the end of the level, after you and the Arbiter fight through the Covenant to stop Truth from firing the Halo rings, the Flood will turn against you. Fight your way back to the elevator, but DO NOT drop through the vent at the end. Instead, turn around, facing the 7 holographic rings. From here, the closest ring is 1, the farthest away is 7. FOLLOW THIS SEQUENCE: 4 6 5 4 5 3 4 (If you listen closely, the humming noise of each holographic ring corresponds to one of 7 notes on a musical scale, and the sequence of notes produced by the rings in the sequence follows the tune of the last seven notes of the Gregorian Chant from the famous Halo Theme). Afterward, head all the way back to the control console and the skull should be on the floor just in front of the light-bridge. Effects: Carrying it throughout the level will make you start the next level with a Spartan Laser and your current secondary weapon. This Skull can be found in the reactor room. First, kill all of the Flood forces in the room. Once the room is free of Flood, search the room for some stacked up Deployable Covers. Make sure you have some grenades (not Spike Grenades or Firebombs) with you. Grab one of the Deployable Covers and climb one of the pillars that extend from the upper floor. Deploy the cover and climb it. Then, jump to the upper floor. If you can't do it with the Deployable Cover, throw a grenade on the end of the pillar and grenade jump—if you got the Famine Skull by grenade jumping, you should be able to reach the upper floor in 2-3 tries. When you're up, search around the surface and look down. At some point, you should find the Skull among some bones. It's above the main door. Note: In Halo: The Master Collection, the skull will sometimes fall off its perch when it spawns, falling into the pit and becoming unobtainable. These skulls can be found in the Mythic Map Pack levels that can give you achievements. These skulls only appear when in Forge. Icon: A skull marked with the emblem of the Quito Space Tether. Direction: Above the pit between the two pathways, go up until you see the skull on the ledge. You must exit Edit Mode on the ledge beside it, crouch and get it. Icon: A skull marked with Lekgolo worms. Direction: Near the middle. Between the two pipes connecting the middle to the building. Use Edit Mode in Forge to fly up there. Icon: A skull marked with a Monitor. In Forge, overload the map. Locate the skull and construct a Tube Y-Intersection surrounding the skull. This will serve as your protection against the towers' deadly beam. Place two two-way teleporter nodes; one inside the tube and the other within the map's safe zone. Start a new round and simply walk into the teleporter and obtain the skull. Locate the skull in Theater mode. Place a corner piece of movable corridor with one opening facing in the direction of the skull and the other opening facing the sky. Position yourself within the piece of corridor looking out towards the skull. 'Pick up' the corridor and move towards the skull, the corridor should move around you, absorbing the fire from the Guardian Towers. When you reach the skull simply turn back into a Spartan, crouch down and pick it up. Create a bubble shield in edit mode and pick it up in player mode. Fly to the skull in edit mode. Enter player mode and quickly drop the bubble shield over the skull, giving you time to retrieve it. Enter edit mode, locate the skull, and fly to it. The towers that will normally kill you are deactivated. Icon: A skull marked with the Mark of Shame. Direction: Standing on the sword platform face the windows and the skull is 90 degrees to the right of the sword under the vents. Icon: A skull marked with a harpooned fish. Direction: On the top of a large ventilation shaft beside a "Fronk's" sign. Head for the aircraft carrier & then turn right. Only accessible via Forge. Icon: A skull marked with the symbol of the Citadel. Direction: Find the overshield on the blue side. Then look for the wall with the blue triangular shapes on it. There should be a pillar in-between the shapes. At the top of this pillar, to the right in an alcove is the skull. Only accessible via Forge. Hackers searched the Halo 3 files and found evidence of an "Assassin Skull" in the mainmenu.map file. The same file also had hints of every skulls' locations, and the Assassin skull's hint was "Interred where heroes fall". Interestingly enough, the Sierra 117 Blind skull's hint was "Interred deep within her tomb". That description doesn't match with Sierra 117, but the Assassin Skull's description does (the Chief fell from the Dreadnought at that level). The "unknown skull" on Cortana matches the Blind skull's description, considering that Cortana was trapped in High Charity. Also, if one retrieves the unknown skull before he retrieves the Blind skull, he automatically unlocks the Blind skull in the Campaign options screen, and it's fully functional. Apparently the unknown skull in Cortana was going to be the Blind skull, and Sierra 117 would have the Assassin Skull, but the latter was replaced by the former. However Bungie technically did not remove the "old" Blind skull from the game, nor updated the mainmenu.map file; the Assassin skull and its info were not removed, and the hint for the Blind skull was not corrected. The Mythic Skull has gold teeth. A Skull's melee power is the same as a regular melee, rather than an instant kill with the Oddball. Halo 3 Skulls also have neural interfaces in the back of them, like those used by John-117, Captain Keyes and Lord Hood and etc. The "I Would Have Been Your Daddy" Skull references to the first chapter of Assault on the Control Room, in Halo: Combat Evolved which shares the same name. The skull name is the same quote from the beginning of the level. It is possible to "dribble" the skull at the beginning of Crows Nest, just pick up the skull when unarmed and start rapidly pressing right trigger. On any level with the Arbiter, if you kill the Arbiter in a safe spot, and drop the skull very close to him, he might jump up and grab it and use it as a weapon, going into the fight hitting enemies with the skull as he goes. The "Grunt Birthday Party Skull" is the only skull that appears in all seven of the Halo games that feature skulls: Halo 2, Halo 3, Halo 3: ODST, Halo Wars, Halo: Reach, Halo 4, and Halo 5: Guardians. Halo 3 skulls are generally easier to get than in Halo 2. They can be found on the Normal difficulty, and are often hidden in simple places which require far less skill and time to reach; examples being the Tough Luck, Mythic and Thunderstorm skulls, which only require taking a simple detour rather than a complicated jump challenge. In Co-op, if any of the players do not have the skull of that corresponding level and someone picks it up, the skull will be unlocked in both the menu and as an Achievement for the players which did not already have it. The Common term "Mythic Difficulty" simply refers to a person playing on Legendary difficulty with every skull active. The code containing hints to skull locations and descriptions. The Assassin Skull listed within Halo 3's game code. A Gold Skull as depicted on Bungie.net. A Silver Skull as depicted on Bungie.net.